When dressing for the river it's important to dress in layers. Starting off with a good foundation helps keep you comfortable while enjoying nature and its many elements. The golden rule when creating your layering system is to ditch the cotton. For something to throw on around the house while binge watching the latest Netflix Original series (House of Cards anyone??) cotton is great. When it comes to fishing or outdoor adventures, leave it where it belongs, at HOME. When wet, cotton holds onto moisture, absorbing your sweat like a sponge. Add a cool breeze and that trapped moisture can make you feel chilled, clammy, and uncomfortable. The worst case scenario is you take a fall while wading. This leaves you with wet cotton clothing, no insulation and the risk of hypothermia. Remember, hypothermia can occur in temperatures well above freezing. This is why I use the same base layers for wade trips in the summer as I do for winter. Here are the six essentials layers you need in your fly fishing ensemble that dare I say, will make changing at the boat ramp an almost pleasurable experience? 1. Thick Wool Socks- Always have at least two pairs of socks with you when you go fish. If you are like me, you will trip while putting on your waders and land in the only mud puddle within 20 yards of you. The lightweight profiles and over-the-calf design of Simms Guide Thermal OTC Sock and Duckworths Lightweight Ski Sock keep my feet warm without the bulk. 2. Long Underwear- I always order the warmest thermal layer with matching top. Trout love cold, clean rivers. So unless your bass fishing, you want to keep your bottom half warm. My favorite base layer is the Simms Coldweather Pant. Perfect for on and off the water. Pair it with the Duckworth's Comet Tunnel Hoodie in Royal Blue for a pop of color. 3. Nano Puff Synthetic Jacket- Look for a jacket that can provide warmth even when wet, dries quickly, and can pack down. Get one with a hood to help keep your head warm. Patagonia's Nano Puff Hoodie checks off all of those boxes. 4. Fleece Pullover- For extra protection against the cold and that tangible coziness factor you must have a fleece pullover. Even if it is nice out, pack it in your tote for an easy layer to add just in case the weather changes. The great price of Eddie Bauer's Cloud Layer Pro Fleece means you should probably get more than one! 5. Lined Snood- Need something that will keep your nose warm but allows you to breath? 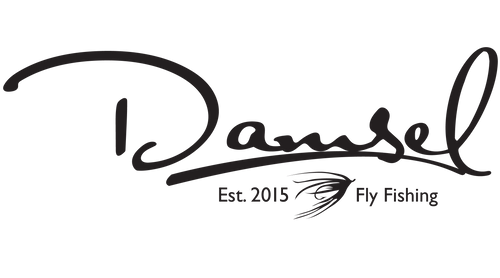 Damsel Fly Fishing's Lined Snood is just the answer. 6. Waterproof Boots- I can’t tell you how many people stop and ask me about my Sorel Slimpack Tall Riding Boot, they are amazing! Classy, comfortable, durable, waterproof AND beautiful all packed into one stylish pair of boots. What more could a girl ask for? Kick off your wading boots and waders, slip these right over your socks and leggings, and instantly transform from river-ready to on-the-town-ready. Bonus Tip: Want to stay out longer on a cold, rainy day? Wilderness Warmth from Balleck is a warming powder made from natural ingredients designed to provide your feet and hands with a warm and dry sensation.